Name origins - the name derives from the old English "Slah" which comes from the Old German. The modern german word is "schlehe" whilst the French call it "prunelle" and the tree"prunellier"
The first blackthorn you will see is on the left hand side of our main gate. 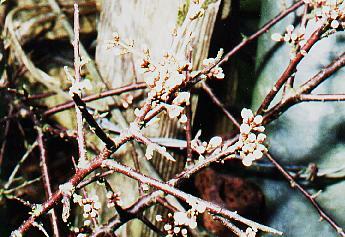 It has black bark and large thorns. 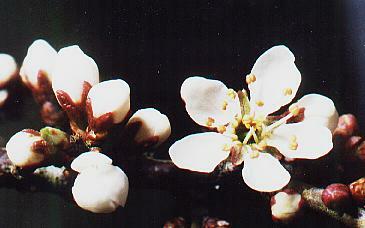 The flowers generally appear before the leaves. (unlike the hawthorn). By September it has fruited, producing the sloe berries. 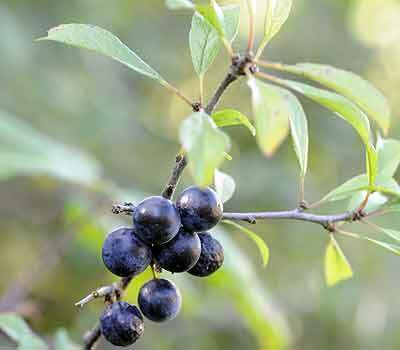 The taste is rather sharp when compared with other fruits, but they can be turned into jam or used to produce sloe gin. Often the fruits are picked after the first frosts in October onwards, which mellows the taste.